Intuition often expresses itself in the negative. You say to yourself: I knew I should have moved the coffee cup away from the edge of the table, when an accident happens and it spills. I knew I should have checked my spare tire – when later you get a flat, and you discover your spare is flat too. I knew I should have taken a second set of keys, when you misplace your first set and you're locked out. You had a hunch, a gut feeling, a “sense” – but you didn't act on it. Because why should you? Then later, you reflect on your intuitive impulse, and you realise that you foresaw the eventuality. But only because you didn't act on it. If you'd moved the coffee cup, you would never have known if it would have spilled or not. If you'd checked the spare, you might not have had a flat. If you'd taken your second set of keys, you may not have misplaced the others. Every day we have prescient thoughts and feelings. This is our PGS tugging at our skirt, or our shirt, trying to get our attention. Sometimes it becomes apparent in an ah ha moment later. I am beginning to listen more to my PGS or intuition. Just yesterday, I felt the need to take my telephone with me when I walked to get my mail (my mailbox is on the side of my house). I grabbed the phone, went out the door and walked to the side of the house — guess what? The phone rang. It was the Company I had ordered my APOC Chapter patches calling. The patches are complete and ready for pickup. They were not due to be ready until the end of next week. The only explanation I have for carrying the phone was I “felt” the need to carry it. Definitely PGS working! Sometimes your PGS does these little things to test you out, and to heighten your sensitivity. I showed you how it worked with the phone, then when something big comes along you know you can trust it. A great story, thank you! Your topic this morning is one that I had to respond to due to what transpired just a few hours ago. I was woken up twice in the wee hours this morning, once by the phone ringing to tell me that my Aunt had passed away,( she was in a coma) and the other which had happened earlier by my Aunt passing through to say goodbye! But, like you, I didn’t quite appreciate the first messenger. To clarify, I woke up because I thought i felt someone in my room (which of course there was) and the first thought I had was about my Aunt. I then began to cry thinking to myself, “I will never see her alive again” I fell back to sleep and 2 hours later got the phone call from my sister confirming my “sleepy” PGS message. I’ve been in a quiet mood the last few days since hearing that my Aunt, who would have turned 90 on Sept 13 and who was the first person to teach me about love in my life, was in a coma. My uncle told me that I needed to come to see her in the next couple of days if I wanted to see her alive and I had chosen this afternoon to be that time, but I kept thinking I should go yesterday or last night. But as you say, I didn’t listen to my PGS and here I am now reminded that the powers that be were once again looking out for me but I wasn’t allowing myself to hear them. I’m not beating myself up and am instead grateful to her that she passed through me on her “way” to touch my heart and soul and as I share this with you all, many beautiful tears are falling from my eyes while I lay here in the same room and bed where I last felt her. Thank you for your meaningful words and for giving me the opportunity to share some of my grief. In love and memory of my dear Aunt Edie!! My prayers will be lifted for Aunt Edie and those who love her. Thank you so much Arlene. My aunt was more of a mother to me than my own so it is especially sad but special. My Mom is now the last living member of her family of origin and sadly has Alzheimer’s so I’m not sure she will really appreciate that her younger sister has gone home. Your love is far reaching, thank you. That is beautiful Jill, what a sacred experience and a gift to cherish. My heart grieves with you for the loss, and celebrates what a special person she was in your life. Jill, I am sorry for your loss. Please know that the Order of St Andrew prayer group is praying for the peaceful repose of Aunt Edie’s soul.Blessings! Thank you so much Sister. It means so much to have my “new family” be so supportive of my family of origin. i appreciate your thoughts, prayers and love very much. Steve and I were just talking about how much my Aunt Edie meant to me and how much I will miss her presence but as you are all reminding me her love and spirit will remain intact in my heart forever. Jill, my thoughts and prayers are with you as you come to terms with the passing of Aunt Edie. Cherish the memories. Laugh about those funny little quirks which I am sure were part of her life. Shed tears of gratitude for the lessons learned from Aunt. Know that she will always be with you. May she rest in peace. Blessings and a big hug from afar. BTW, my nan was named Edie also. What a great message. I love that. I’ve been shedding tears all day and just a bit ago talked to my Uncle and we both had a good cry on the phone. Death is such a part of life, isn’t it? Aunt Edie lost her only child , her daughter, almost 20 years ago and I remember how hard that was for her. Thank God she had my uncle there to get her through it. Today, they are together again so in some strange way that makes me so happy. Again, want you all to know how meaningful it is for me to receive your love and well wishes. I’ve just woken up here in Oz and read this post. How dreadfully sad, and how extraordinary that you were visited by her before her passing. Jennifer and I send our deepest love to you, and our sympathies. She was obviously very special to you, and that feeling was obviously reciprocated, as evidenced by her visitation. She dropped by to say goodbye, and thank you. What a glorious thing to do. And what a unique relationship you two must have had. And now you have this memory of her last goodbye that you will keep with you for the rest of your life. Thank you also Jill for sharing such a personal event here on this blog. It’s a testament to the integrity of the people here – knowing that they love you and care for you – that you should feel you could do so. I wish I was with you now so I could give you a big hug, and do something really stupid to make you laugh. Like setting myself on fire? Are you driving or riding? Driving. You know I can’t text and Ride.Ha ha. Actually, with Siri, I can dictate. Looking straight ahead at all the traffic right now. I’m going to pick up my songwriting sister in Nashville and take her back to Henderson. siri is amazing isn’t it? But does it read out this message too? I haven;t heard from your other sister for a while. Is she ok? I would love to go through Tennessee – I think it would be an amazing state to explore. Wait a minute I never knew Bill was a dwarf! How did I miss that. Teehee!! I am definitely staying away from dwarf jokes!!!! I know bad on me! I just needed a laugh! Forgive me short statured people!! It’s produced by Ricky Gervais, and it’s based around a dwarf actor. It sounds like you need a good laugh, so you should check it out. LIFE’S TOO SHORT is a British show, but you might be able to pick it up on Netflix. It’s about 8 episodes, I think, and it is very funny. All based on this dwarf that runs an actors agency comprising of dwarfs. What a beautiful response! Thank you both so much for your loving words. I do feel very special to have had the spiritual visitation that I did and yes, she was such a special person in my life. My Mom was told she had mono when I was born and 58 years ago the treatment was bed rest and no physical contact. So, my Mom had to turn my care over to my 2 aunts and thank goodness my Aunt Edie was such a loving, caring person who held me close and taught me how love feels. One of the reasons I sign everything Xoxo which supposedly signified hugs and kisses is that I am a hugger and a kisser most likely due to Aunt Edie and the motherly love I felt from her those first 6 months of my life. Steve always laughs and says, I have to hug every person in the bar before I go home!! And it’s pretty true!! It’s a very, very windy and rainy day here in sunny Palm Springs and I have always associated rain and wind as a message from a loved one who is passing. As if they are wildly waving goodby as they move to their next home. The bigger the wind, the larger the persons spirit. My aunt is leaving a large wake in the sky! As I have said many times before, Bill it is you who has created this safe haven for the rest of us to share our voices, our experiences, our pain and our love so I again say thank you! I wish you were here too as I would gladly accept your big hug and know we would be laughing about some crazy thing as well! Who needs the Village People when I have you all, the World People!! How gorgeous Jill – you are an amazing lady with a huge huge heart. So when Jennifer wakes I will bring her up to speed with all of this. This term “passing” is a fascinating one – passing presumably from one plane of existence to another? But what are they passing to? That is an interesting use of the term and seriously I’m not sure when or why “passing” has taken on the meaning it has outside of the thought of passing from one dimension to the next or the housed spirit” passing through the structure of our body into the larger atmosphere free to roam the entire universe rather than just this plane that we call home. ( Is that a run on sentence, or what! )See this is what I love about you and what makes you such a great facilitator ( I know you don’t like to be called a mentor) you stimulate me to be a deeper thinker and a better communicator. 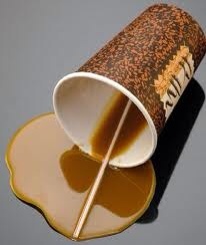 On another note, is that really a spilled cup of coffee ( your 3rd or Jen’s 2nd) or is it melted Carmel? It’s looks fake and I love it!! it’s an image I pulled off the net. Jen and I were talking about this yesterday, because she’s always terrified of spilling her coffee into her laptop. Jill, I have just had a beautiful walk around my neighborhood and reflected on many things, especially the memories invoked by certain flowers. I thought a lot about you and your beloved Aunt Edie and had a “chat” to my Nan, Edie. She was a very special person and even after 30 years, I still miss her. Thankyou for rekindling the memories. I am going to write a separate post in my blog, based on this. My little granddaughter is named Eadie, in loving memory of my nan. The name lives on. How great is that Anne! I’m so happy for you and am so glad that we have our Edie connections together. Maybe they will become friends wherever they may be!! And how lovely that your daughter shares a name with such a great energy! Thank you for your lovely thoughts. It’s only been these last 7 years of my life that Aunt Edie and I have been together. She and my grandmother moved from Buffalo, NY to Whittier , CA when I was 3 and I only saw her a handful of times till Steve and I moved to CA in 2006. So I had her in the beginning and thankfully til the end! In that way I was very lucky. Thank you for your concern and generosity of love. With all these things that go on in my head and heart it is very difficult to know and tune into which is the intuitive, and trust that it is my PGS rather than one of the many other things that come into it. I really have thought about this a lot. Sometimes I feel like I might be getting it, then i just throw up my hands and really don’t feel I have a clue. I just keep going back to the thing I know for sure. God loves me and i can tune into trusting this, and learn to love others better. Is Intuition about listening more, feeling more, or letting go and letting God more? it’s a really good point you raise here. We can create such noise around ourselves that it’s often very difficult to hear the important whispers. And if you have an active mind, as you have, how can you differentiate between logic, reason, and intuition? The film on PGS, and the book I will write too, will discuss the four steps necessary – STOP, LISTEN, TRUST, FOLLOW. Stopping is very important – by stopping, you stop the wind rushing around your ears. The noise, the chatter. And then you have to ask – and the response will come back, and you’ll now it’s your PGS. But stopping, asking, listening,then trusting enough so that you can follow is what you need to do. Your intuition is like a muscle – it needs to be trained, and developed. And then it can become a very powerful aid, or guide. Thank you so much for your kindness and support. I too am glad that I woke up to feel her passing through. Her love and presence will be with me for the rest of my life. You can purchase the series from Amazon, so I’m thinking Netflix may have it too. Oh God, I’m almost afraid to admit on here that I am laughing out loud!! That was too funny. Painfully so! What a talented person and did be really fall onto the floor! Tell me he hit a mattress!! Oh Jill – on this particular day, it’s so great that you’re laughing!! It is very very funny. The whole show is like that. Yes it is!! Thank you!! I have very specific comedic taste and most comedy I don’t find funny but that is on my radar screen in a big way. Way to go, Bill. if I’ve helped to lift your mood today on this sad sad day, then my job is done! It’s true, my friend, so thank you!! That’s a beautiful post Britta! Jill, there is nothing more beautiful in a ceremony to say goodbye, than to have it fall on their birthday. I think its such a meaningful way to honour their passing into a state of joy, while in a way also celebrating that we will one day join them. You are so right. I couldn’t agree with you more. It feels like perfect symmetry at its best. I know she will be with us on her special day in many ways. Again , thank you all so much for caring and sharing. Jill, I am sorry to hear about your aunt………..love that this group has grown enough to support people when they need love, web-log love or otherwise. Bill: Question for you about the Stop Listen Trust Follow….is that something you have created yourself, or is it based on another philosophy? Also………….”I Knew I Should Have” in my life is usually “I Knew I Shouldn’t Have.” I find that messages come to me from so many places I need to apply a fine filter. Finally, fasting for peace today…………. Hi Julie. Just wanted you to know I’m fasting for peace today, too. I’m going on a two day fast too! For health or spiritual reasons? Did you ever get that leg brace? Mine is extraordinary -what a difference. I fast regularly, normally to still my rampant mind. It kind of helps me put it back in the box. Is that spiritual? I don’t know. I haven’t got the brace yet – I am reluctant to get one off the internet, because I believe it has to be fitted according to the particular needs of the injury. I simply haven;t been able to get onto the company. They never answer their phone. I will have to do something though – my knee is still troubling me, even with these Glucosamine tablets – and I have a long walk to do next year! And I have a frisky nun to keep up with! If its to settle your mind, its spiritual. Are you seriously going to pay someone 900$ to “fit” your brace? I did that years ago (when I had money to throw away), they spent five miutes telling me to try on different types, measured from the middle of my kneecap six inches up and around -and the stupid thing never was comfortable! I measured myself for the new one and its fits like a glove.. I went on the brace US website to see what the cost was there – about $650, as against $1200 here. And I DON’T have money to throw away!! Yeah, just like all Texan oil folk are rich!! That shows your age Steve!! I’m sure there’s a youtube clip on how to fit your knee brace – they’ve even got one now to measure your own torso to fit a backpack. I did my own measuring and spent $35 on a brand new brace like the one you showed us.Its making a huge difference -it takes the weight off your knee, and now I never have to worry about my knee buckling and landing me on my teakettle. I am amazed at what you can find on YouTube to help you do stuff. I am going to look into it. I have a very real aversion to paying $1000+ for a brace when I know I can get one for a quarter of the price. I was not 100%, Sister….but it was good. I fixed a “Phake” Pho Ga for dinner for the rest of the crew here and ate a small bowl. I want to do this one day a week now. It can’t be Saturdays in the future though…too many people coming and going and part of me just wants to keep it to myself….Bill, I hear you about having it help center you or reign in your mind. I agree with you, that it was wonderful to see people swinging their love and support behind Jill yesterday. It was very touching, and I’m sure it helped Jill with a difficult day yesterday. Regarding STOP, LISTEN, TRUST, FOLLOW – that’s all me, or rather my PGS! 🙂 It will be explained more fully in the film and the book. It’s just a way of hooking into your intuitive self. Bill, be sure to triple check the shipping costs on something coming from the US. My brother lives in the Melbourne area and our other brother shipped him a pitching machine because it was $750 USD and not $1500 AUD….but the shipping and import costs added up to more than the $1500 AUD! You might be better spending the money on the Synvisc shot. The shopping was included in the cost – $38 for Standard International Shipping. Which means it will take about 3-4wks. But I’m not in a hurry. Also, I paid by PayPal so I have a bit of recourse.